Twist and turn as you like. 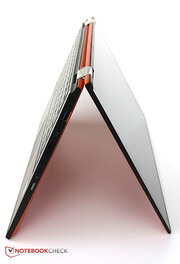 The screen of Lenovo's Yoga line can be completely folded owing to a clever hinge design. Both the Yoga and Yoga 2 Pro were popular devices, and now Lenovo launches the Yoga 2 13. Our test reveals that not a lot has changed, but some things have been disimproved. It could make a gymnast envious: Some would simply love to be as flexible as the Yogas from Lenovo. It all started with the Yoga from 2012, and a few devices have been added since then. 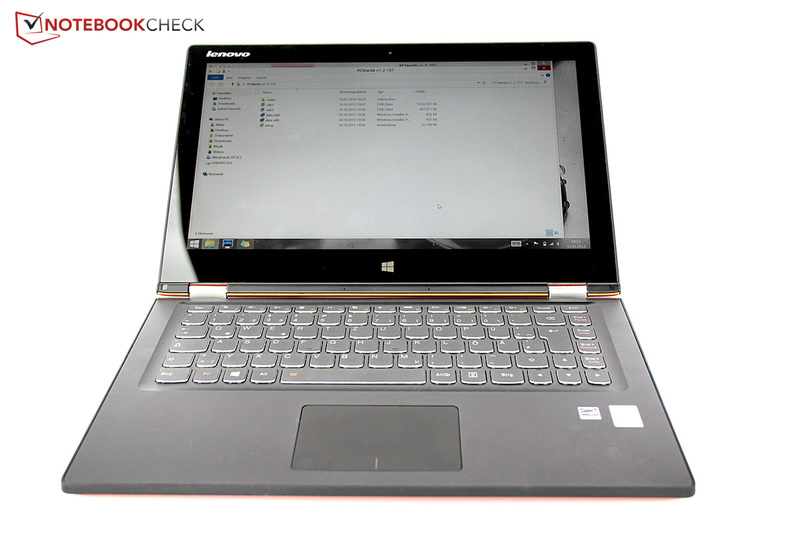 The Yoga 2 Pro that was released on the market in late 2013 did some things a notch better than its precursor. Now the Yoga 2 13 stands in our test lab. It does not look much different than its predecessors at first glance. It is, however, not alone in the category of slim convertibles: For example, the Toshiba Satellite W30t or the new Asus Transformer Book T300LA are already on the market. HP's Spectre 13 x2 or Sony's Vaio Duo 13 are also interesting devices. - Laptop Mode: The Yoga 2 13 can be used as an absolutely conventional touchscreen laptop when the screen is opened by 90 degrees or a bit more. - Tent Mode: Watching movies or a more stable touchscreen utilization are made possible when the screen is folded by approx. 270 degrees, and the laptop is placed on its edges. 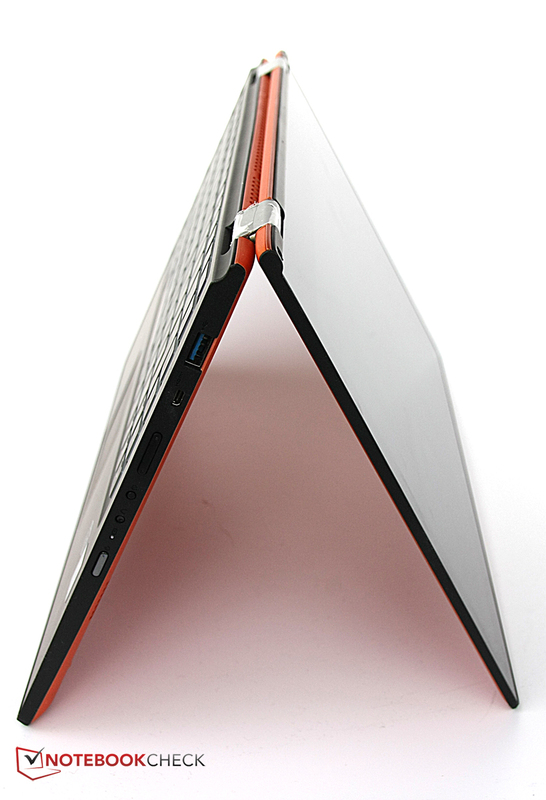 This mode is called "Tent" because the Yoga 2 13 looks like one from the side. - Stand Mode: Of course, the Yoga 2 13 can be simply placed on the keyboard to use the touchscreen instead of setting it up on its edges. The keyboard is naturally protected against unintentional inputs. - Tablet Mode: The Yoga 2 13 can be held in the hand like a tablet when the screen is completely folded to the back. However, it is a bit heavier than other tablets because the keyboard also has to be held. 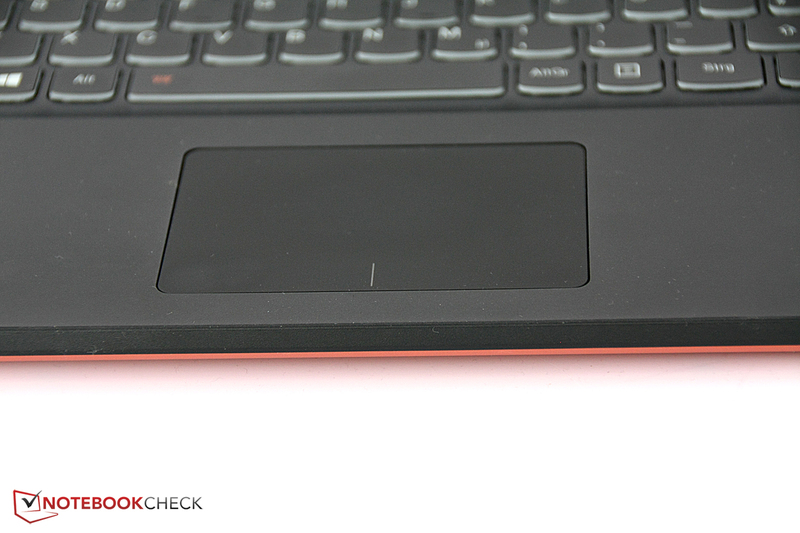 The Yoga 2 13 automatically detects the mode and locks the keyboard when required. It even offers special apps for each mode. 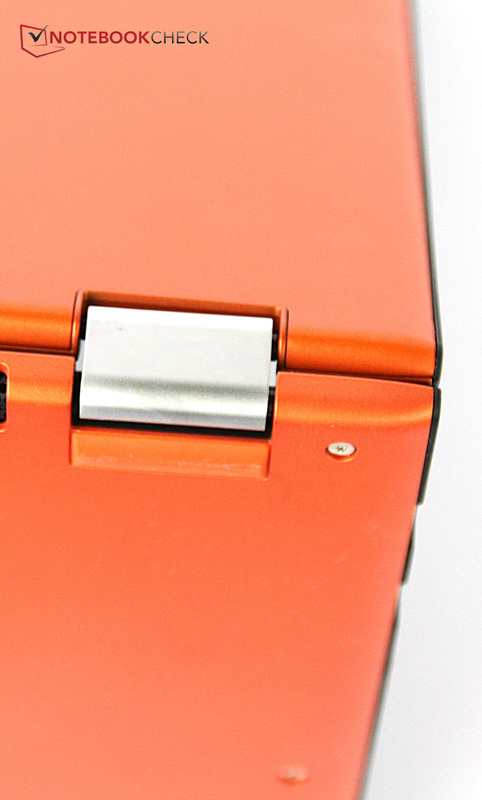 The hinges are strong and can keep the screen stably in position in all modes. Nevertheless, they cannot completely prevent a slight wobbling. Folding the screen is no problem despite the tightly pulled hinges and is even quite easy with one hand. There is a major difference compared with its precursors after all: The rubber-like soft-touch surfaces on the lid and underside have been axed. It is now only matte, but considerably less non-slip plastic. At least the keyboard bezel and wrist rest are still roughened so that the Yoga 2 13 can be held fairly securely in Tablet Mode. However, the leatherette texture of the Yoga 2 Pro was more slip-proof. In our opinion, the material's feel has clearly deteriorated compared with the precursors. The design is still quite basic, and only the keys' lower edge as well as the orange color of our review sample is a bit jazzy. Weight fluctuations are found among the generations: The Yoga 13 had a weight of 1.55 kilograms, the Yoga 2 Pro weighed just under 1.4 kilograms, and the Yoga 2 13 has gained a bit with a weight of 1.56 kilograms. The Yoga platform has continually developed in terms of standby button and interface positioning. At first, the standby button was located on the front where no one would assume it to be, and thus it took a while before finding out how to turn on the device. Besides that, it was only hard to reach in Tent Mode. The button was moved to the right, but in the front area in the Yoga 2 Pro. Now it is more centered. Apart from that, the USB 2.0 port and USB 3.0 port as well as the micro-HDMI and headset jack have swapped places. Whether that makes sense likely depends on the situation. We did not discover any advantages or disadvantages of the swapped ports in everyday use. There are two more buttons on the right, beside the standby and volume rocker. One opens "Lenovo OneKey Recovery" and the other locks screen rotation via the position sensor. These keys are quite small and only hard to find without looking at the sides. At least the "OneKey Recovery" button is submerged so that it will unlikely be triggered accidentally. Not much has changed in wireless connectivity since the Yoga version from 2012. Wi-Fi standard 802.11 n is the fastest connection that is available. 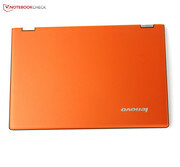 However, we frequently had severe problems with the Wi-Fi connection in the Yoga 2 Pro. They have apparently been eliminated because there were no connection downtimes during the entire test. We took the convertible on a trip and moved up to ten meters, placing two walls between it and the router. Approximately four-fifths of the signal was maintained, and the speed was also still satisfactory. The reception clearly decreased even more when another wall and two more meters were placed between the device and router. The speed only dropped a bit, and normal browsing was still possible without major restrictions. There is no LAN port because the device is simply too slim for that. However, Bluetooth 4.0 is installed. Only the power supply is included. Otherwise, Lenovo offers accessories on its website, but not much will be found apart from a replacement power supply for just below 60 Euros (~$80) and a matching sleeve for 45.22 Euros (~$60). 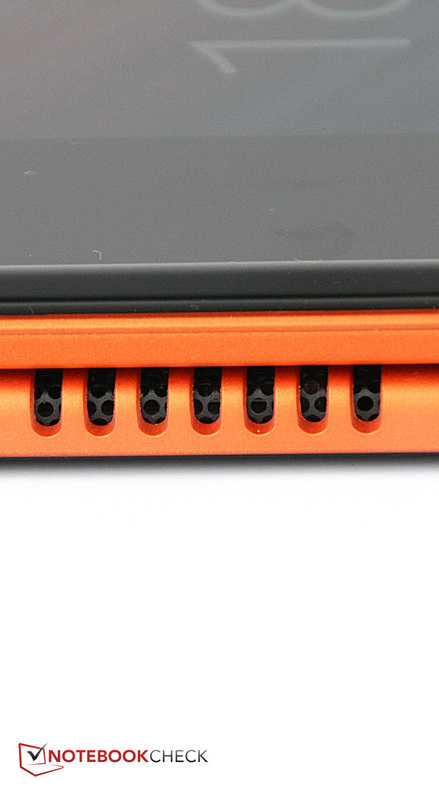 A few Torx screws have to be removed before the user can access the innards of Lenovo's Yoga 2 13. That is necessary when, for example, the battery has to be replaced. The working memory is soldered to the motherboard, thus making any replacements impossible. A warranty period of 24 months is included according to a card in the box. Lenovo also offers various warranty upgrades: The Yoga 2 13 can be protected against any kind of damage for 30.94 Euros (~$41). Two years cost 79.73 Euros (~$107), and a three-year manufacturer-only warranty adds 59.50 Euros (~$80) to the purchase price. The 3-year, all-inclusive warranty that covers all damages is the most expensive at 133.28 Euros (~$179). 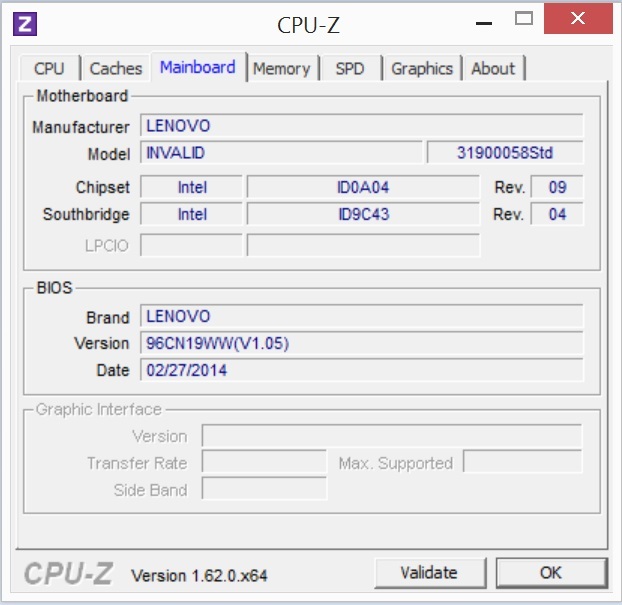 We will now take a brief look at the device-specific software that Lenovo preloads. "Yoga Picks" automatically detects the device's current mode and offers matching apps, such as touch-apps for Tablet Mode. 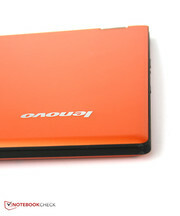 "Lenovo Companion" provides help, support, and other topics about the new device. 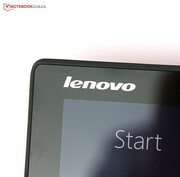 It is possible to log-in via face recognition using Lenovo's "VeriFace Pro." That functioned reliably and quite swiftly in a short test. Lenovo's "Motion Control" should respond to motions via the webcam; however, we could not persuade it to respond to our gestures. 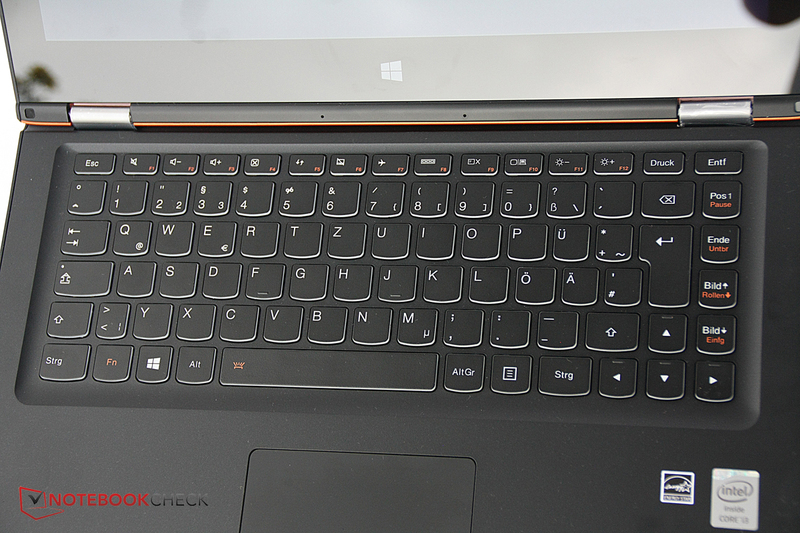 Compared with the Yoga 2 Pro, the keyboard has not been greatly modified, not to say not at all. The typing feel on the chiclet keyboard is compelling in the category comparison, but the keys' drop could be longer. However, they are smooth-running and clearly lettered. The key noise is very audible but still less noisy than from many mechanical keyboards. The keys are relatively large with 14 millimeters in both height and width, which makes it easy to hit them. 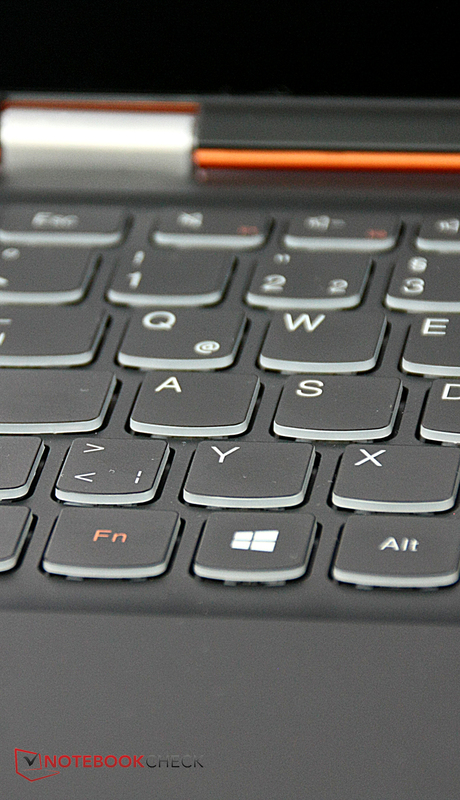 The "F" keys at the keyboard's upper edge are primarily assigned with other functions and can only be triggered via "FN" combinations. However, important combos, such as "ALT + F4," function anyway. There is also a keyboard backlight that can be turned on and off quickly using the key combination "FN + space." Note: When the light is on and the display is closed, neither the keyboard light nor the screen turn off. The standby button must be pressed for that. 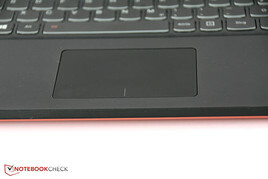 The touchpad is actually a bit small with a diameter of 105 millimeters, especially seeing that it is a ClickPad that incorporates the buttons in the touch-sensitive surface. That occasionally leads to inaccuracies. However, it is possible to work quite reliably with the ClickPad after some getting used to it. The touch-sensitive surface is agreeably sleek and sensitive. The keys are stiff and only feature a very short drop though. 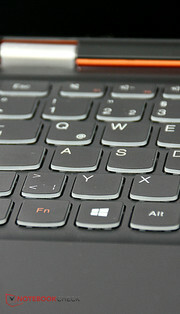 The touchpad detects and supports many gestures when multiple fingers are used. For example, zooming in and out is possible by pinching two fingers in or out. The user can scroll through documents or the Windows 8.1 start screen using two fingers. The capacitive touchscreen supports inputs using up to ten fingers at the same time. Thus, many gestures are supported. The touchscreen is pleasant to use and responds very fast and accurately to inputs. Drag and drop is very comfortable. However, the screen does not offer much resistance in Laptop and Stand Mode so that the screen always wobbles after use. 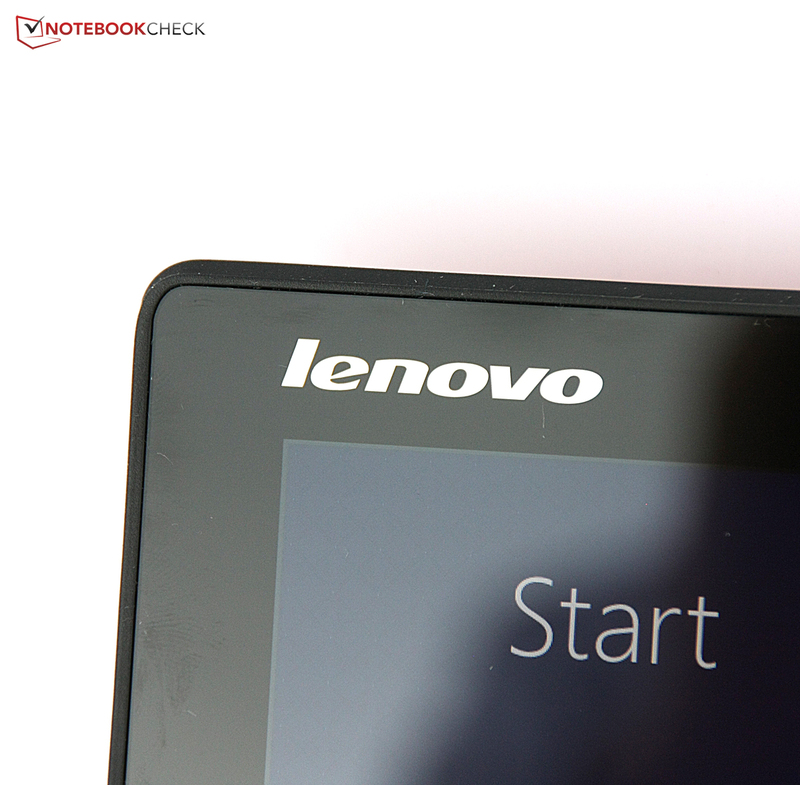 Lenovo relied on a PenTile screen in the Yoga 2 Pro. 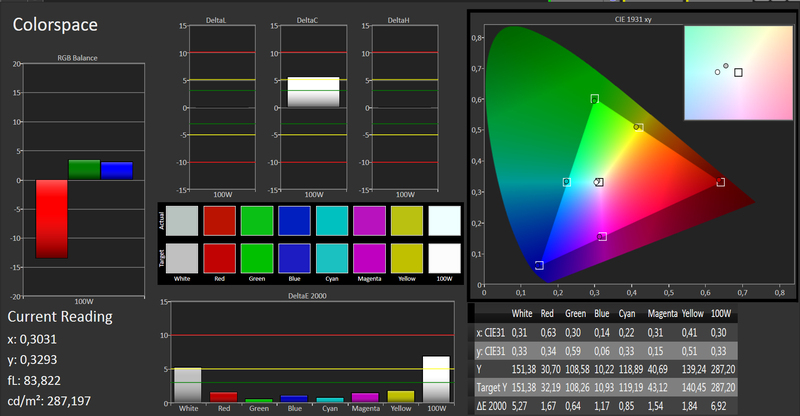 It is cheaper in production and consumes less power than conventional RGB-stripe screens. However, PenTile screens use one-third fewer sub-pixels for reproducing the same resolution. The resulting loss of focus is compensated via rendering techniques, but apps and programs might blur depending on the zoom factor. 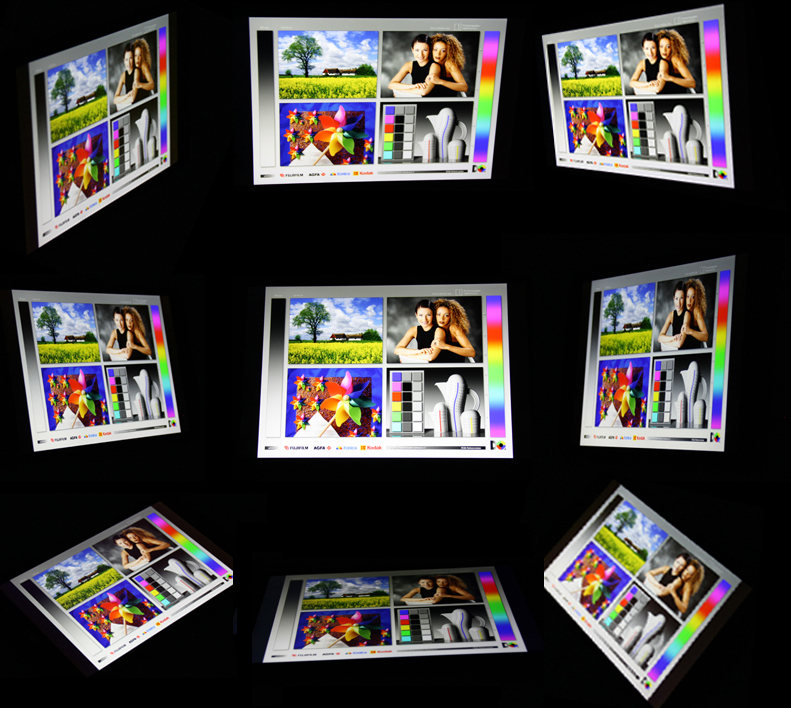 This technology is used in the Yoga 2 13's screen; it has a resolution of 1920x1080 pixels. We noticed blurry logos, picture and fonts multiple times in the test, which resulted in a very unsightly image impression. Although that is usually tolerable from a normal distance, and the fairly small screen in relation to the resolution, it does not look nice. The brightness is middling compared with the contenders. Sony's Vaio Duo 13 and even the former Yoga 2 Pro have considerably brighter screens. 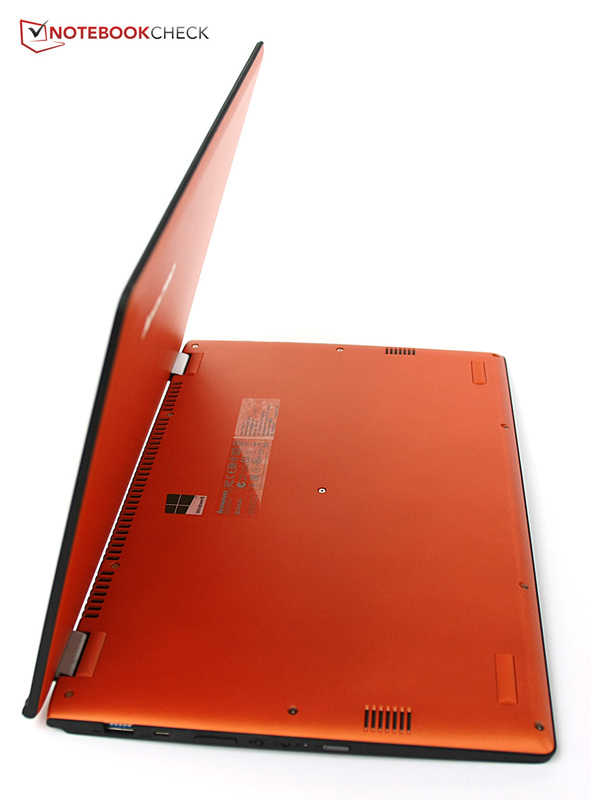 The Yoga 2 13 achieves an average of 248.6 cd/m². The illumination of 86% is satisfactory; no visible differences in brightness are seen with the naked eye. The screen of the Yoga 2 13 is also midfield: We ascertained 673:1. The black level of 0.4 cd/m² is also satisfactory; black areas look dark and rich. 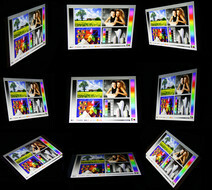 The subjective color reproduction is good; the screen's glossy surface additionally enhances the brilliancy. We examine the color reproduction more precisely with the colorimeter and CalMAN software. 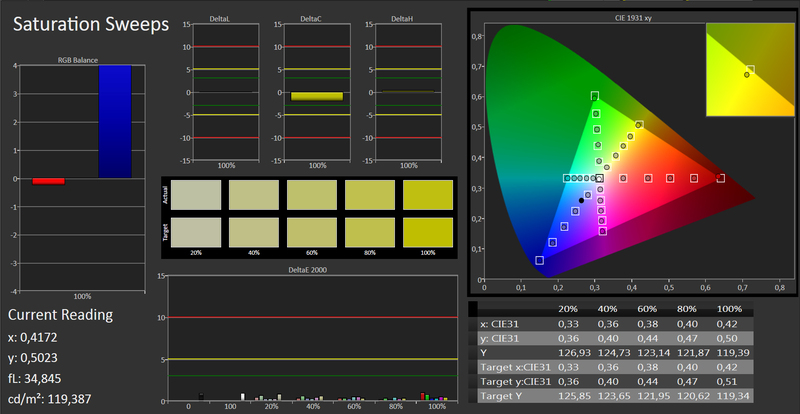 Here, we find that the screen provides very decent color rates in state of delivery. Only the saturation of blue and green hues is too high so that colors look a bit too cold. The sRGB color space coverage of 84.2% is correspondingly also quite high. 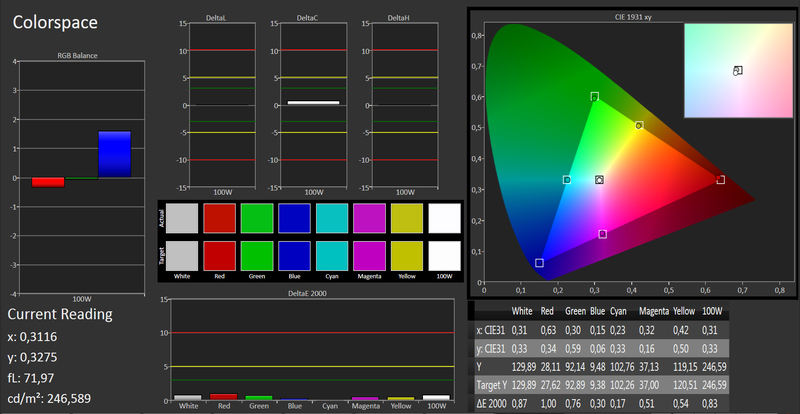 Excellent results are achieved by calibrating the screen. 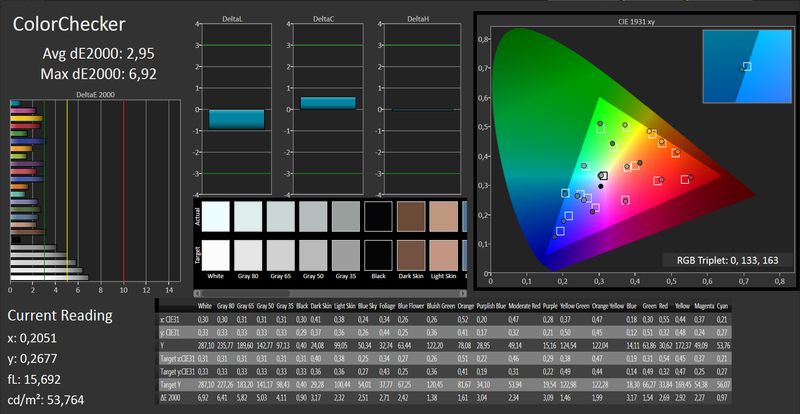 It reduces the color rates' average shift from the ideal value to 0.51. 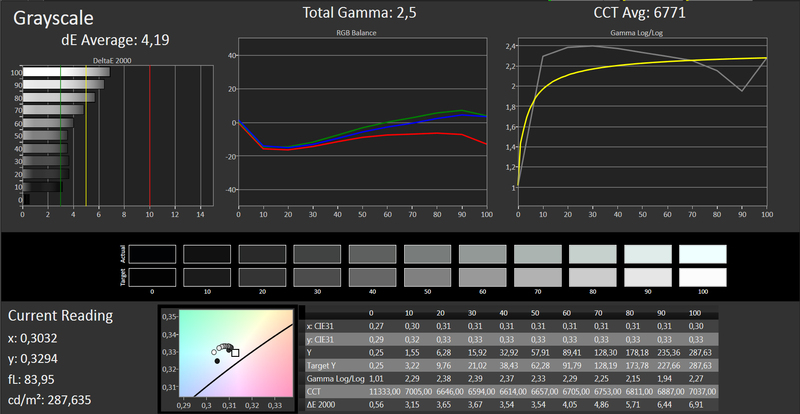 The color hues then almost exactly correspond to the sRGB reference color rates. The glare screen is quite reflective outdoors. Additionally, the generally moderate brightness makes it rather difficult to work in bright daylight. Eyes will have to be strained in order to recognize content even under cloudy conditions. Depending on the position, it is possible to work comfortably in the shade or in bright rooms. The IPS screen cannot stably maintain the brightness when looking from the left or right. 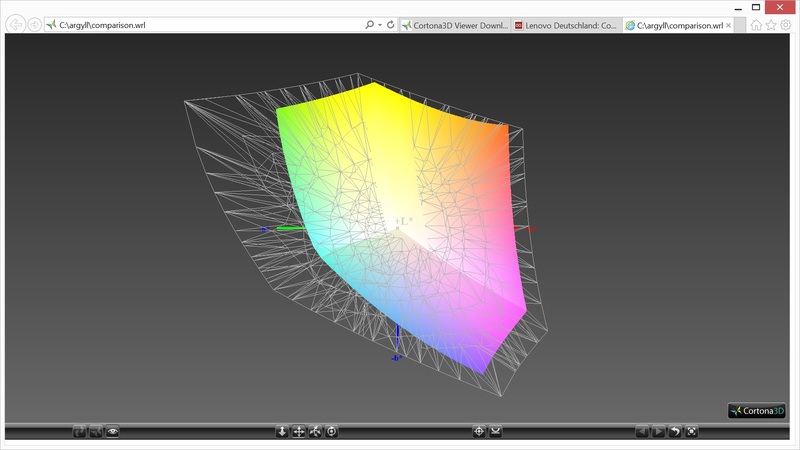 However, the content is always very well visible, even from very flat viewing angles. That is true for all four directions. Buyers looking for high-performance processors in Lenovo's Yoga 2 13 will be a bit disappointed. To distinguish it from the Yoga 2 Pro, only Intel's Core i3-4010U is offered. 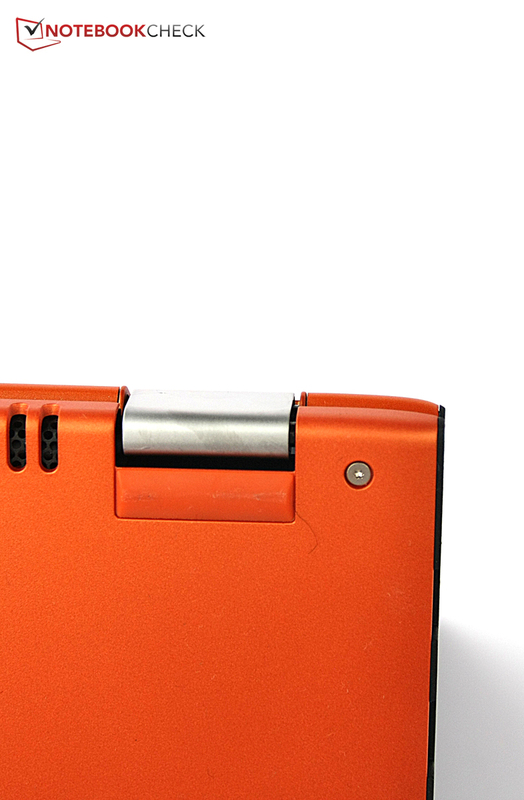 Apart from that, the Yoga 2 13 is only shipped with a conventional hard drive and 4 GB of working memory. Other configurations are currently not available. At least the device can be upgraded by the user. Intel's Core i3-4010U is a dual-core processor that clocks with 1.7 GHz and supports Hyper-Threading. Thus, it can calculate up to four tasks simultaneously. However, it does not feature Turbo Boost like its bigger family members. The synthetic Cinebench benchmarks show just how much performance it loses. Intel's Core i5-4200U in Asus' Transformer Book T300LA or Yoga 2 Pro achieves a clear edge of averagely 50%. Even the ULV processor in HP's Spectre 13 x2 has a slight lead. 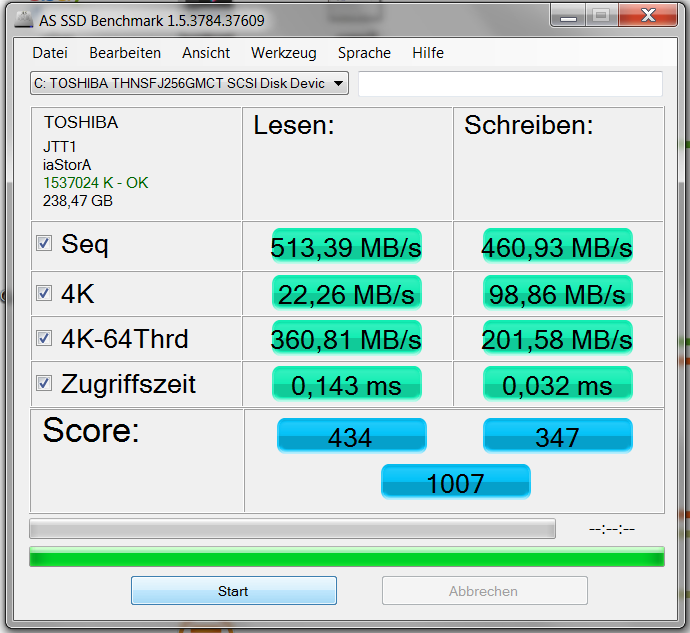 Only Toshiba's Satellite W30t with an even slower clocked Core i3-4020Y lags behind marginally. 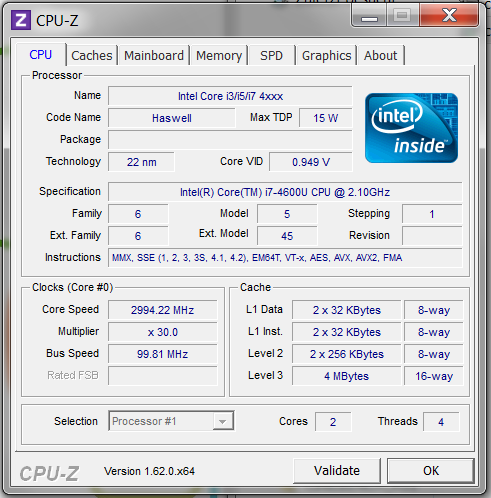 The processor performance of Intel's Core i3-4010U is enough for most routine tasks, but rendering or even multitasking of more demanding programs is a challenge for the processor. Both the slightly weaker processor and the conventional hard drive become evident in system performance, which we will deal with in a moment. 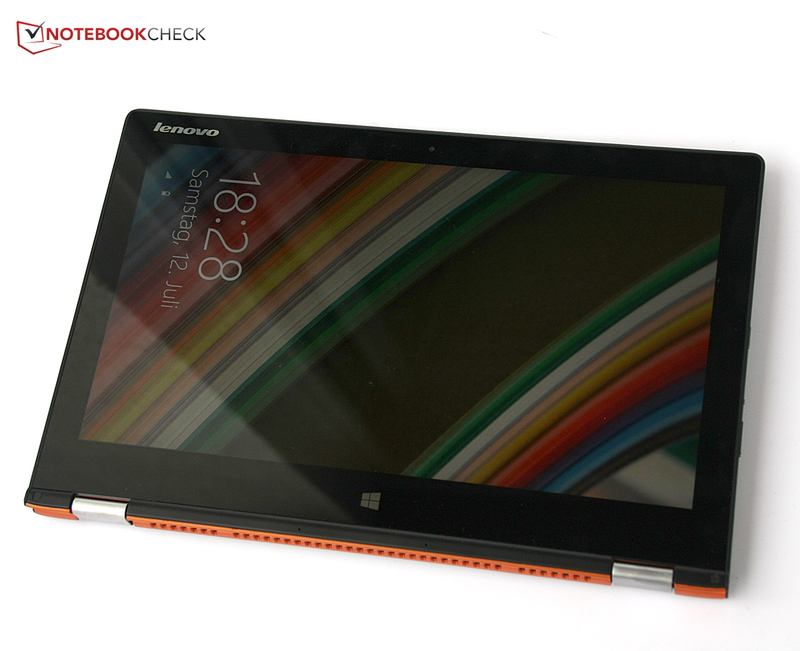 In any case, the Yoga 2 Pro with an SSD achieves a 114% higher score in PCMark 7. Only Toshiba's Satellite W30t, also with a conventional hard drive, is roughly on par with our review sample. All other comparison devices clearly outperform it. This is noticed in the operating system's booting times or when copying larger amounts of data in practical use. Although Windows 8.1 is not usually shut down, waking up from standby or opening applications takes longer than in devices with an SSD. The advantage of conventional hard drives is, of course, a considerably higher storage capacity for a low price. 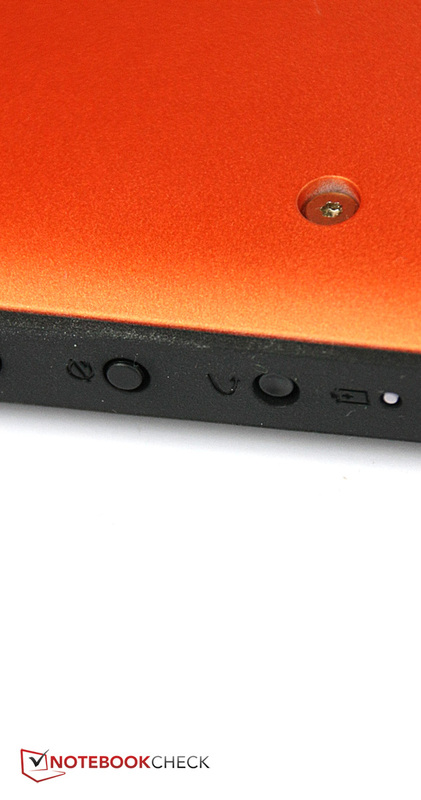 A 500 GB hard drive is installed in the Yoga 2 13. Approximately 426 GB of that is available; the rest is reserved for the system image. The hard drive from Western Digital naturally does not stand a chance against the speeds of SSDs, which leave it miles behind particularly in reading and writing random sections and the access times. Seen purely as a hard drive, its transfer rates and access times are within a normal range though. Intel's HD Graphics 4400 is used for video output. It consumes less power than a dedicated graphics card but also is considerably weaker. 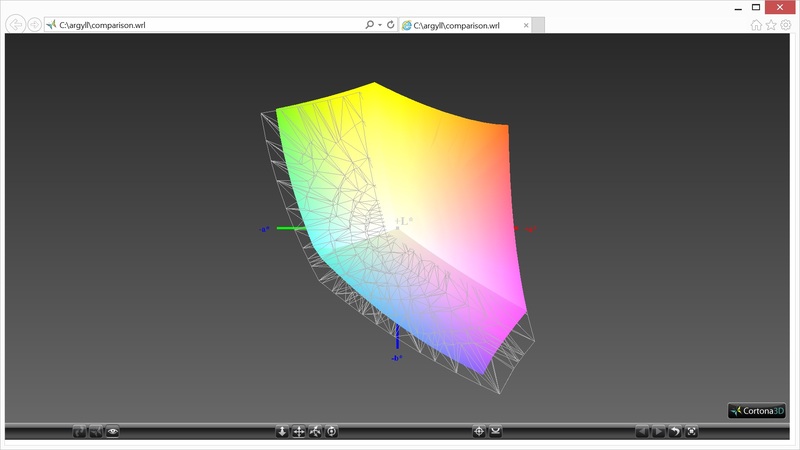 Demanding 3D applications or 3D games are hardly possible without lags. However, the scores achieved in the synthetic 3DMark benchmarks are not at all bad. The contenders are on par since they all sport the same graphics card, except for HP's Spectre 13 x2. 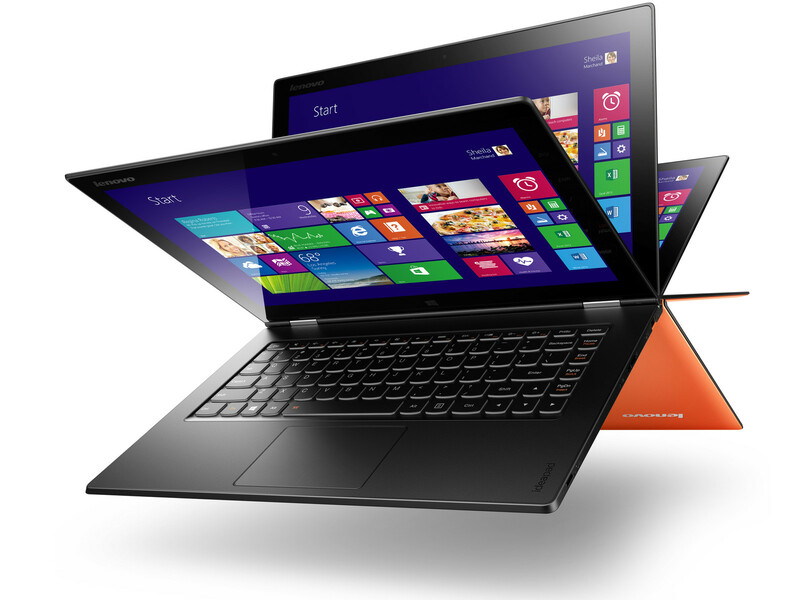 Lenovo's Yoga 2 13 nevertheless manages to place itself just before the other devices. Its lead is overall slight and will hardly make a difference in practical use though. Gaming on a convertible? That is usually impossible, and it is also difficult on Lenovo's Yoga 2 13 - at least when the user wants to play up-to-date games. The integrated graphics card is more designed for routine tasks than for gaming. However, older or even current, less demanding titles can be played in an extremely reduced resolution and few details. Anno 2070 and Diablo III also run satisfactorily in 1024x768 pixels and minimum details. The fan runs permanently even in idle mode, though very quietly. Lenovo's Yoga 2 13 does not show any weakness in idle operation: The noise remains below 30 dB(A), and thus on the level of most contenders. HP's Spectre 13 can even cool its system passively and is consequently absolutely silent. The Yoga 2 13 gets a bit louder than the other devices in the comparison field during load. None achieve a maximum of 39.6 dB(A). This very audible fan noise will, however, rarely be reached in practical use though. The cooling system is generally fairly quiet and will not be distracting on the desk. However, most of the other compared devices operate with even less noise. Considering that the fan spins louder than most contenders, the maximum temperature is quite high. Up to 47.8 °C on the underside's rear left is quite a lot, and the laptop should no longer be used on the thighs. At least the wrist rest remains relatively cool even during full load. Besides that, the same applies here as for the maximum operating noise: These high temperatures will unlikely be reached with the Yoga 2 13 in everyday use. The device barely heats up when idling. Up to 32.9 °C is only achieved on the casing's rear center. Again, the wrist rest is the coolest part here. The laptop's performance capacity quickly drops in the stress test, and the processor's clock rate is also reduced. It then only clocks with 1 GHz and occasionally drops even more. Interestingly, a higher clock is reached in battery mode: 1.3 GHz is reached in full load, but not stably and that is not the processor's nominal clock of 1.7 GHz either. 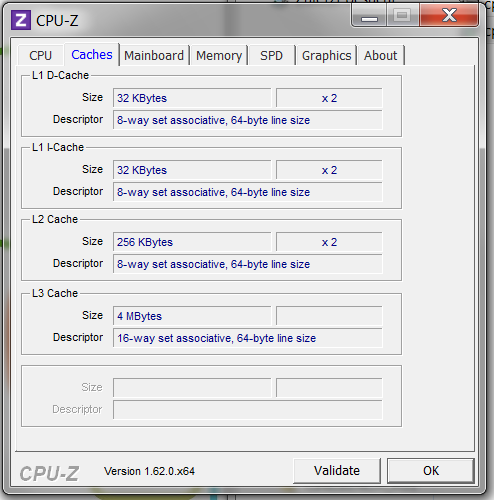 That means that the processor's performance is clearly throttled under absolute full load. However, the maximum clock is achieved in Cinebench R15, and the maximum clock in Cinebench R15 in battery mode is 1.3 GHz. (±) The average temperature of the palmrest area of similar devices was 29 °C / 84.2 F (+0.6 °C / 1.1 F). 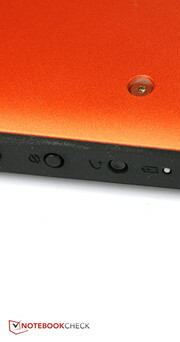 The speakers are located on the underside, in the casing's right and left. A hard surface improves the sound, but a soft surface could muffle it. The maximum volume is compelling, but not as much the sound. The trebles are very overemphasized, and there is virtually no bass. However, the speakers do not boom even in maximum volume, and the sound remains clearly defined. Overall, the speakers are satisfactory for a slim convertible, but more would have been possible. Not even the "Dolby Digital Plus" software can improve it much. In our opinion, it even muffled the sound a bit depending on the setting. The power consumption is relatively high particularly when compared with the system's performance. 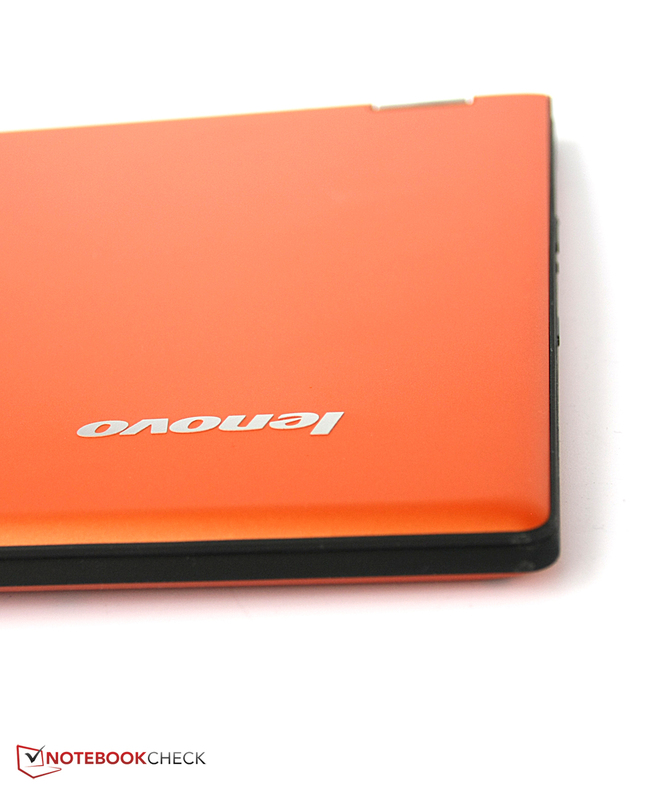 Lenovo's Yoga 2 13 consumes up to 9.8 watts in idle mode. Of all comparison devices, only Toshiba's Satellite W30t comes close to this rate. Finally, the absolute maximum consumption of 42.3 watts is the highest rate in the comparison field. The standby and off modes are not satisfying either: the laptop still consumes 0.3 watts when it is shut down, and 0.5 watts in standby. "Far below that of many other modern ultrabooks" was our opinion about the Yoga 2 Pro's battery runtime a few months ago. 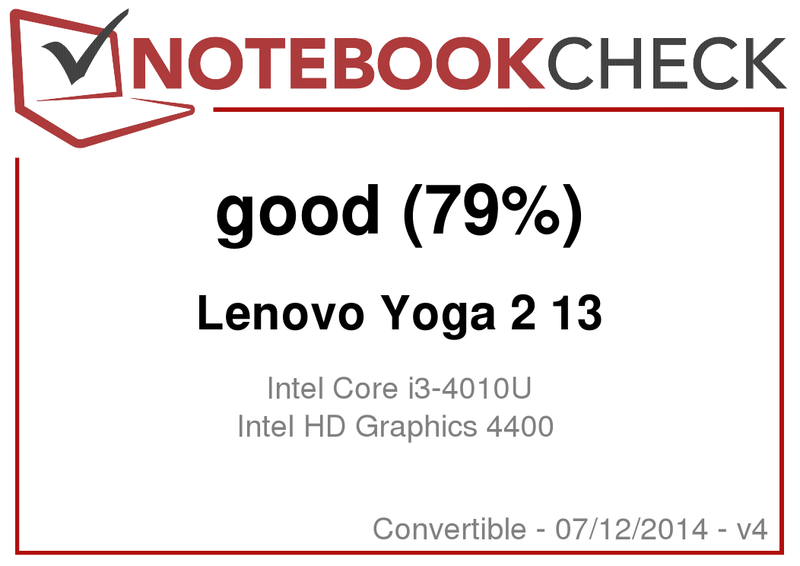 We can underline this verdict again in the Yoga 2 13. The battery's capacity has not changed: A 54-watt hour battery is still installed. The Yoga 2 13 achieves a maximum idle runtime of 7:06 hours. We surfed via Wi-Fi for 5:02 hours before the energy was drained. Those are not outstanding rates; the recently tested Asus Transformer Book T300LA lasted for more than twice the time. Although the runtimes of Lenovo's Yoga 2 13 are everyday suitable, the device has to be recharged much sooner than the Yoga 2 Pro or most other contenders. In review: Lenovo Yoga 2 13. Apparently, 2014 will not be the year where manufacturers rely on innovations and spectacular technologies to convince buyers. Instead, they seem to prefer cutting features in order to reduce production costs, and consequently also the prices of their devices. Now, a low price should reel in customers. This trend is also obvious in Lenovo's Yoga 2 13. Where the soft-touch surface added quality and grip to the Yoga 2 Pro, it has vanished in the Yoga 2 13 and has been replaced with simple plastic. 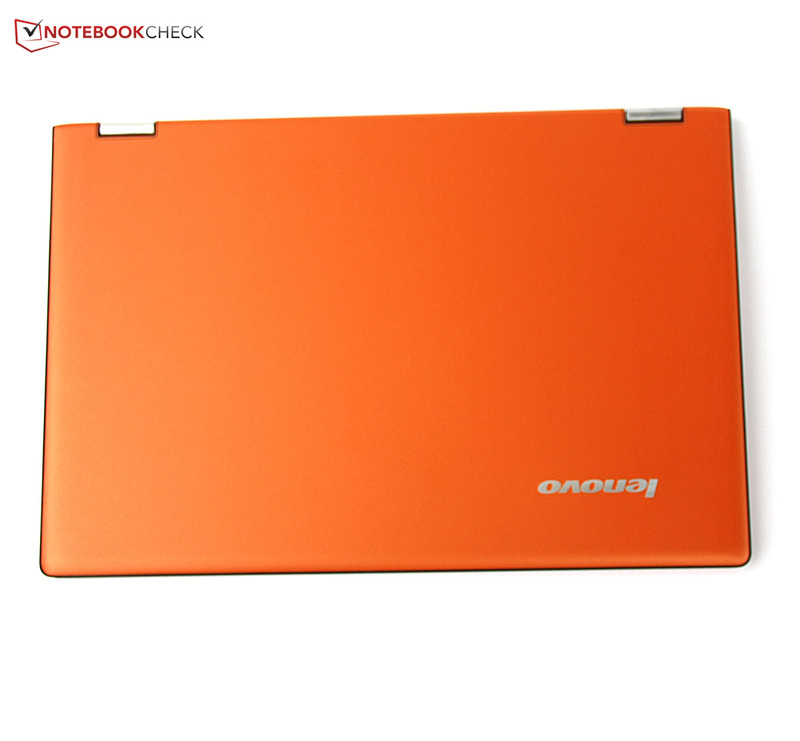 The casing's temperature and noise pollution from the fan have also increased compared with the Yoga 2 Pro. The battery runtimes are now shorter despite a weaker processor. The PenTile screen still produces strange blurs in the image. Only the functioning Wi-Fi module, the screen's high color-space coverage, the still clever hinge design, and the solid build are satisfying. The connectivity also continues to be acceptable, and users who dig out older games can even play on Lenovo's Yoga 2 13. 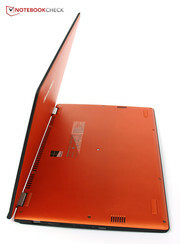 Overall, the Yoga 2 13 makes a slimmed impression compared with its direct precursor, the IdeaPad Yoga 13. Here, the manufacturer likely wanted to make a clear distinction to the more expensive Yoga 2 Pro. It is great that Lenovo and Intel have eliminated the problems with the Wi-Fi module, but compromises have to be made in many other areas compared with other convertibles. Since these compromises never affect the everyday suitability, the Yoga 2 13 can be considered in the purchase decision due to its clever hinge design. The resolution of the 13.3-inch screen even makes more sense than that of the QHD+ resolution in the Yoga 2 Pro. 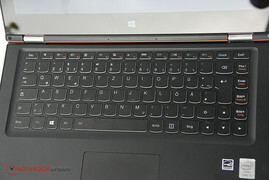 However, it does not feature an SSD or the soft-touch surfaces. 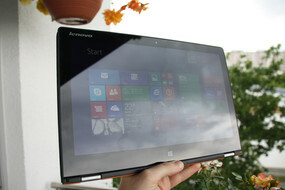 In Review: Lenovo Yoga 2 13. Review sample courtesy of Notebooksbilliger.de. 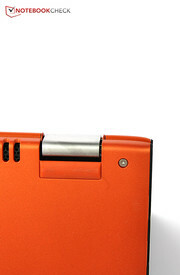 Because the screen can also be folded to the back, quite a lot of operating modes are possible. And the hinges find the right balance between stiff and smooth-running. Thus, the convertible's modes can be changed easily. Unfortunately, the soft-touch surfaces have been replaced with simple plastic. At least the flashy orange color has been maintained. The keyboard is illuminated and is designed stylishly. The Yoga 2 13 is a bit heavier than the Yoga 2 Pro. It can still be held in one hand in Tablet Mode, but that is not as comfortable as with real tablets. However, the keyboard can be also used as a tablet stand. Lenovo has conceived the concept well. But the ClickPad is a bit small. Naturally, Windows 8.1 is preloaded. The operating system is well-suitable for convertibles. Intel's Core i3 still powers the laptop sufficiently. The speakers are loud but don't sound very good. The webcam is only suitable for video conferencing. These Torx screws have to be removed before accessing the convertible's innards. Though the fan is not obtrusive, it is a bit louder than in other convertibles in some cases. 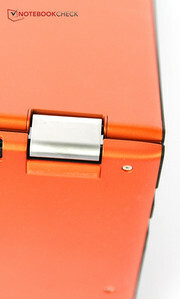 The clever hinge design is still first rate. The soft-touch surfaces were a part of the Yoga concept for us, and the lack of them is all the more painfully missed. How transformable the Yoga 2 13 can be is truly impressive. Lenovo Yoga 2 Pro, Toshiba Satellite W30t, Asus Transformer Book T300LA, HP Spectre 13 x2, Sony Vaio Duo 13.